I read another article recently bemoaning that people were taking so many photos of their lives on their mobiles that they were missing out on the 'real experiences', and even less likely to remember them afterwards. Maybe we are not missing out on a real "experience", if there is such a thing. Perhaps we can also discover an "experience" or even an "existence" through taking photos. The Japanese photographer Gentaro Ishizuka puts it like this in the notes to one of his books, 'Lensman':" In this world of unstoppable time, where no one can grasp anything in its entirety, it may be entirely possible that the reality of these things captured by the camera in pictures, could, in fact, trump one's own reality". I like Ishizuka's metaphysical approach to photography because it is visually very much grounded in the sober and everyday. He seems, like me, to be a photo opportunist, at least for this project: "My next theme will be things that simply catch my eye when going out for no particular reason, or just everyday things". He is also conscious of the fact that no matter where he is, he experiences a kind of "déjà vu" with his pictures. "Finally, after this remote journey following the Pipeline (in the Arctic) to its most distant point, I had once again found that scrap factory on Harumi Pier". He goes on: "...perhaps all these things were simply images pulled from one's own consciousness". Fascinated by junk that he had discovered in a disused factory there many years before, Ishizuka adds,"Bathed in the faint light seeping through the walls, these discarded radios, television, and other miscellany took on new meaning with a multitude of shapes, shadows and substance. And in that place without a soul, taking pictures in deep meditation, there was oneself". And I would add, that as much as there is "oneself" in such places, there is also the "not oneself". The void, the blindspot of the self. This in turn may lend even the most empty of places a soul. Even if we can't see the blindspot, we can try and depict it, experience it. 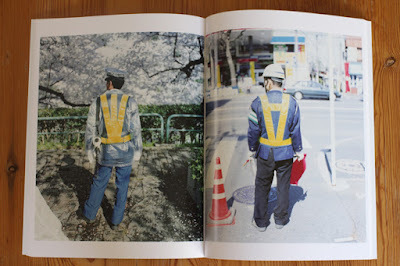 As in Ishizuka's photograph above, we can't see our own backs but it is still an interesting view. This piece was inspired by the artist book meet-up in Edinburgh that takes place once a month. (The pictures were taken at Fountainbridge in Edinburgh on the site of a former brewery. The Grove is a community garden project also at Fountainbridge. At "The Forge" people can learn carpentry and welding skills in workshops held in shipping containers. The new Boroughmuir High School is also being built there.) Here are some pictures of the same site from two years ago.